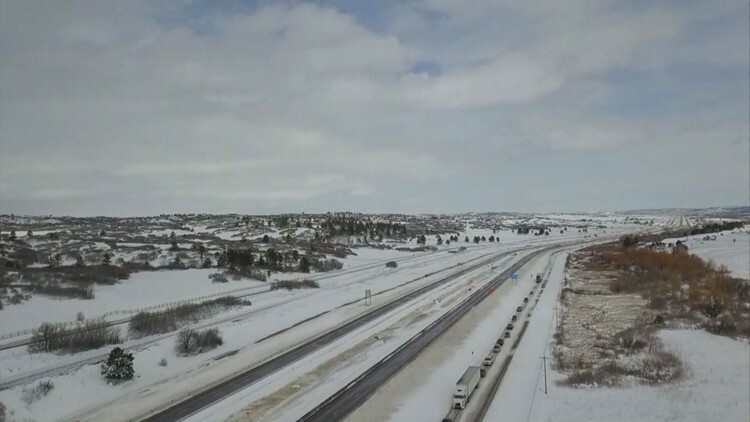 Drone video of I-25, which was shut down between Castle Rock and Monument Thursday morning following a large blizzard in Denver. The victim was found about 35 miles east of Colorado Springs on Thursday. COLORADO SPRINGS, Colo. — Police say a Colorado man found dead after a blizzard went out during the storm to start a generator. The El Paso County coroner's office on Monday identified the man as 68-year-old Harry Brantley. Authorities found his body Thursday about 35 miles east of Colorado Springs. The massive blizzard struck Colorado and Wyoming on Wednesday. It contributed to the death of Daniel Groves, a Colorado State Patrol officer who was killed by a car as he helped another driver who had slid off Interstate 76 near Denver. The county sheriff's office says a caller reported that Brantley had gone out during the blizzard to start a generator at another building on the property and did not come back. The cause of Brantley's death has not been determined.